With TotalPoll, you can now create polls within 60 seconds! Its user friendly interface was expertly designed to make poll creation hassle-free. With Totalpoll, you gain more engagement with an optimal viewing experience for your visitors. 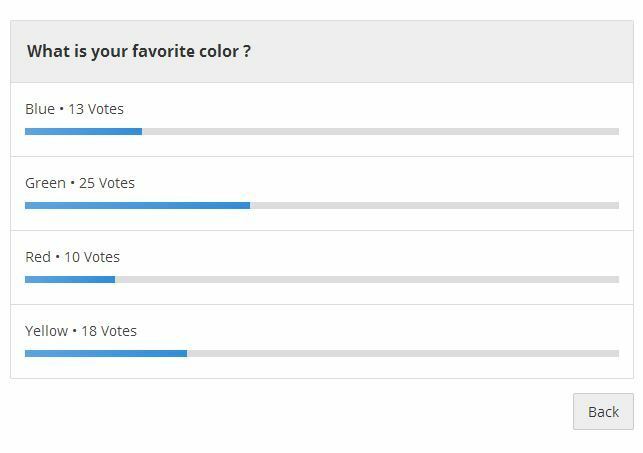 And your polls will always look amazing whether in a laptop, tablet or a smartphone. Search Engine Optimization is a very key factor for every website. Thus, TotalPoll makes polls more search-engine friendly in order to get more search traffic. Do you need “Welcome message” or “Thank you message”? We have got your back! With over 5 customization settings, you definitely have the total control. Collecting additional information from voters has never been that easy. With our unique 5 different field types, you can absolutely collect everything. Regular vote tracking has been made easy. You can now track votes daily, weekly and monthly. Even, you can track custom field values with votes. TotalPoll was developed with performance in mind! It functions without a glitch with WordPress. Give your polls more attraction with Text, image, video, audio, shortcode or even HTML. Totalpoll integrates your polls everywhere like with a shortcode, widget or even a direct link. Trace back every vote, with an informative log (status, IP, browser and time) to identify any cheating attempts. The ability of Totalpoll to reduce votes and results makes it easy for you to specify conditions under which visitors can vote in a poll or see its results. The extensibility of TotalPoll makes such extensions and templates possible. Developers can certainly make TotalPoll a step further to suit your needs. Are you planning to switch? You can migrate from WP-Polls and YOP poll easily (and many more plugins are coming). TotalPoll is compatible with other plugins and technologies like WPML, Polylang, ACF, WP SUPER CACHE, Varnish, HHVM, W3 Total Cache and others. Help us translate TotalPoll to your language. Enrich your polls with premium templates and extensions from the creators of TotalPoll. Make your polls look compelling with customized templates. Take TotalPoll’s functionality a step further with powerful extensions. A regular poll with text choices. The very basic variation of polls. Another variation of polls that focus on two choices only. Dilemma is a poll of of two unfavorable choices or alternatives. A contest poll based on photo or images choices. A contest poll based on videos (YouTube, Vimeo and self-hosted) choices. A contest poll based on audio tracks choices. Similar to Twitter polls fancy design. Similar to Facebook polls fancy design. The knowledge base cover every aspect of TotalPoll functionality and provide a step-by-step tutorials ang guides to get started with TotalPoll in almost no time. Customer support is our most important priority that’s why ~70% of reviews are about support quality. We take this responsibility very seriously. Don’t take our word for it. Hear what our 2,300+ customer say. Great app, does everything I need. Quality customer support very very fast and very professional! This is a great plugin with loads of features and very clean code. The response to a support request came so quickly that I thought it was an automated message, It wasn’t. Very happy with this plugin and the author’s quick support! Bought the extras pack to get additional features too! TotalPoll Pro has everything to make polls engaging and attractive. The best thing about the plugin is, it allows me to insert links in the poll answers. I’ve increased my affiliate sales by adding affiliate links in poll answers. Thanks for making this amazing plugin. Loved it. This really is a great plugin, and support was so fast and precise when I needed some help. 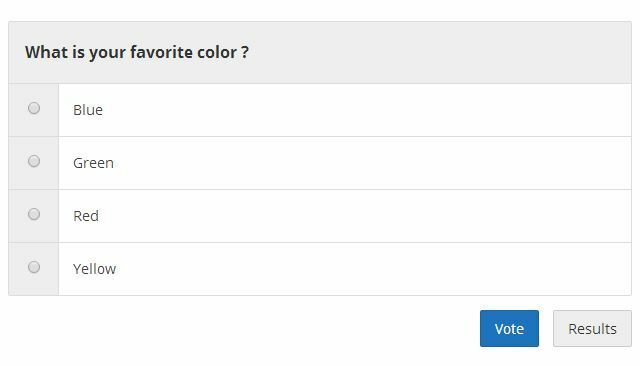 I can truly recommend this plugin to everyone who needs a good customizable poll on the website! Cache compatibility (W3 Total Cache, Super Cache, Quick Cache, Fastest Cache, WP Rocket, WPEngine, ZenCache, HyperCache, Varnish). Support and knowledge base directly from your WordPress dashboard.. List polls with shortcodes and total votes. Edit and reset poll choices votes. Block re-votes by cookies with possibility of setting a custom timeout. Block re-votes by IP with possibility of setting a custom timeout and white-listing and black-listing. Set membership exclusivity (only selected user roles can vote). Enable captcha (powered by reCaptcha). Set a start or end date or both. Regenerating poll’s unique ID to reset voters. Require voting before seeing the results (blind poll). Set order criteria and direction (votes, alphabetically, ascendant, descendant etc…). Hide results until reaching some criteria and replace it by custom content. Set the number of minimum selected choices to vote. Set the number of maximum selected choices to vote. Allow user submissions (other field). Set custom CSS classes for field input and label. Customize typography settings (font family, line-height, size). Customize template’s settings (colors, layouts, choices per row etc…). Set welcome message (before voting). Set thank you message (after voting). Votes over the last 30 days of activity. Download logs as CSV or HTML. Download submissions as CSV or HTML. Install or update extensions and templates directly from the store. Purge cache (Templates cached CSS). Activate TotalPoll with Envato license key to receive updates directly on WordPress dashboard. Download debug and system information. Bug fix: Choice visibility is now honored when used with “Other” field. Bug fix: When exporting logs / submissions, sometimes the date column is ignored. Bug fix: Filter validation list is always empty. Bug fix: Sometimes regex validation fails. Bug fix: Username in logs is empty. Improvement: Improved compatibility with ACF. Improvement: Purge cache now purge global cache for better results. New: Advanced options to control TotalPoll behavior. Language: Polish language (Thank you Pavel!). Template: Adding shortcode support for default template. Fix: Error when downloading custom fields submissions. New: Filters (hooks) for dashboard. Bug fix: Editor blank templates/extensions upload page. Bug fix: Editor issue when removing old choices. Bug fix: Results fragments aren’t honored in poll settings. Update to default template behavior when displaying videos. Bug fix: Asynchronous JS load issue fixed. Improve hooks (actions and filters). Fix a bug when re-ordering HTML fields. Add minified version of share-buttons.js file. Customize above and bellow poll content for each step. Enable/disable voting with direct link. Button to copy direct link for every choice. New hook (action): “totalpoll/actions/poll/vote” can be used for tracking successful vote requests. Fix small issue with media contest template. Allow only one vote per member (user). Fix a bug in print & download results page. NOTICE: TotalPoll 2.x users must upgrade the existing polls to the new version. Introducing the all new TotalPoll 3.0. Migration from other poll WordPress plugin. And much more. Read the product description. New: Italian language. (Thank you Marco Rossi Paccani). New: Spanish language (Span and Peru). (Thank you PixelStudio Peru and Eduard Coromina). New: Portuguese language. (Thank you Hugo Corenzan). New: Romanian language. (Thank you Ron DuPoits). Improved: Choices saved across pagination. Fixed: extra check for add_query_arg security vulnerability. Fixed: some bugs in default template. Fixed: Logs download (Date and encoding). Fixed: upload button not working correctly. New: TotalPoll requires WordPress 3.5 or newer. NOTICE: This release contains some breaking changes, if you have a custom addon, please contact us before updating to 2.5.
fixed: Design customizer – array to string conversion bug. new: WYSIWYG for HTML choices. new: Poll shortcode in polls listing. new: Brand new “cache compatibility” addon. new: Brand new “recaptcha” addon. new: IP timeout accept “0” value (for a permanent lock). new: export results addon ( export results of all polls ). fixed: save as draft and auto save bug. deprecated: logs ( txt format ). new: logs ( csv export ). new: image with the question. new: fixes common conflicts with themes. Some bugs has been fixed. fixed: User was able to see results even if “User must vote to see results” enabled. new: Results chart (meta box). new: anti-cheating and limitations layers. new: customizer , presets and preview. new: compatibility with cache plugins.